Tom and I are splitting weekends between fun weekends and project weekends, and we already have plans for two exciting ‘fun’ weekends for March. We’ve got tickets to see the Yosemite Concert of the Mariposa Storytelling Festival on March 15. Getting to listen to professional storytellers is something everyone should do at least once in their lives, and we’re extra excited because Kevin Kling is performing this year. The last time we heard him on the radio we laughed until we nearly peed our pants. For our other ‘fun’ weekend, I’m getting my hair cut in the Bay Area on March 29. Not only will that be a celebration because I’ve been looking forward to getting my hair cut to donate to Locks of Love but I’m looking forward to a ‘city weekend’ and seeing friends. Have I mentioned that since moving to the mountains I’ve become fond of shopping? 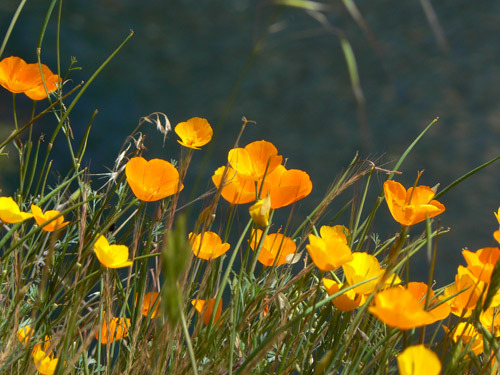 If we’re creative, we’ll manage to find a way to get out to Glacier Point and visit with our friend McCray before the end of the season, and take a quick wildflower walk too. Wow! Michael has some really nice photos. I added him to we love yosemite.